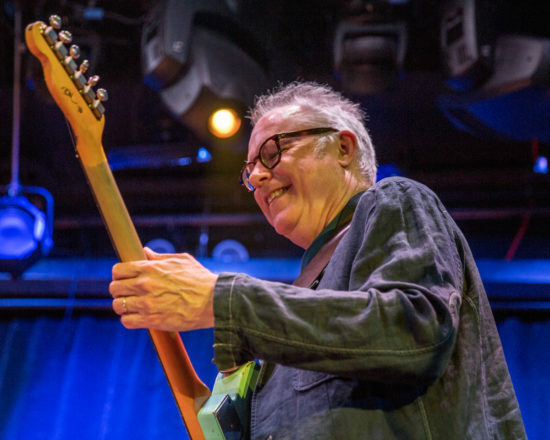 “These are all my teachers up here,” Bill Frisell said on Thursday night (June 21) at Le Poisson Rouge in Manhattan’s Greenwich Village. He was referring to four of his fellow guitarists—Brandon Ross, Matt Munisteri, Julian Lage, and Marvin Sewell—who share his reverent yet open-ended attitude toward the jazz-guitar tradition, and who’d joined him for his Guitar Invitational, part of the 2018 Alternative Guitar Summit. 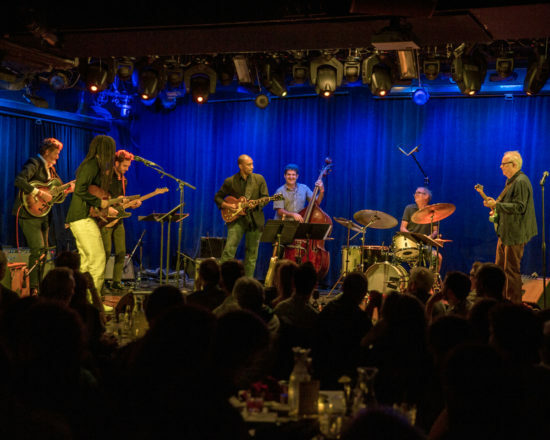 Over the course of an ably programmed two-hour concert (the second of two shows performed that evening), Frisell, his guests, and his veteran rhythm section of bassist Tony Scherr and drummer Kenny Wollesen offered an inspired substitute for the tropes of all-star guitar blowout. Whereas even the best jazz-guitar get-togethers—for instance, the various incarnations of the Great Guitars—edge toward the kicks of a cutting contest, Frisell’s concert came off more like a team initiative in musical empathy. Often, the goal onstage seemed to be sheer beauty, with overlapping harmony and rhythmic playfulness the means of getting there. It was an ethos that descended from Frisell, whose catholic tastes, singular tone, and placid attack have long suggested an antidote to chest-thumping theatrics, and it made perfect sense in the context of the Alternative Guitar Summit. Launched eight years ago by the guitarist, composer, and (full disclosure) occasional JT contributor Joel Harrison, the event has highlighted player’s players in jazz, fusion, experimental, and roots music—or, better yet, guitarists combining elements of those idioms and others. This year’s activities also included a “Jazz-Rock-Funk Throwdown,” a rare clinic with Frisell, an evening of intergenerational guitar duos at the Jazz Gallery and, wrapping earlier this month, a music camp in the Catskills. It all has the air of a thinking man’s take on guitar culture, less about middle-aged professionals collecting equipment and more about wide listening and the fertility of the New York scene. Intent and intelligent listening on the bandstand, and how that allows musicians to make interesting choices, was the theme for Frisell’s night. And while the ensemble chemistry was, again, decidedly egalitarian, each player carried his own stylistic weight in ways that showcased particular gifts. Ross, probably best known from the explorative power trio Harriet Tubman, stood out as a texturalist. Munisteri, a bandleader and go-to guitarist for Steven Bernstein, Catherine Russell, Jon-Erik Kellso, Loudon Wainwright III, and Kat Edmonson, provided the delightful underpinnings of jazz guitar’s pre-bop roots; not surprisingly, he was the only hollowbody player onstage. 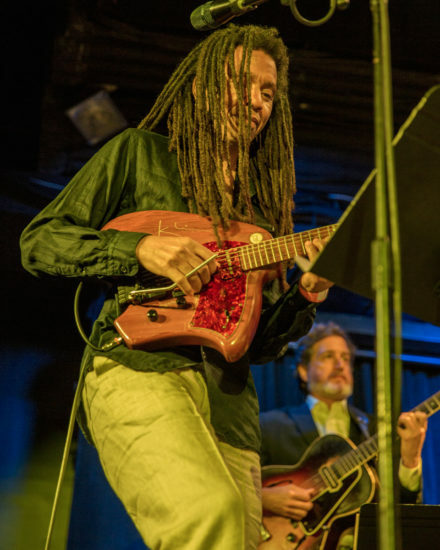 Lage, at 30 already one of the greatest jazz guitarists of all time, projected an easygoing, almost cavalier virtuosity; and Sewell, a rootsy presence on albums by Cassandra Wilson, Jason Moran, Regina Carter, and Lizz Wright, presented an impressively natural feel for the blues. His frequent slide playing tended to make Frisell’s sumptuous, surfy timbre sparkle even brighter, in much the same way pedal-steel player Greg Leisz does. The concert’s repertoire primarily revolved around the man of the hour, with many songs plucked from throughout his durable career, reflecting his versatility as a composer as well as his inclusive ideas about music that can (and should) be passed through a jazz filter. That meant indelible Americana like Hank Williams’ “I’m So Lonesome I Could Cry,” featuring the full assemblage; Stephen Foster’s “Hard Times Come Again No More,” with Frisell, Munisteri, and Sewell; a gravelly, lumbering shuffle through Blind Willie Johnson’s “It’s Nobody’s Fault but Mine” by Frisell and Sewell; a “Days of Wine and Roses” in which Lage infiltrated the Frisell Trio’s lived-in rapport with elegant tracery; and “We Shall Overcome,” a stirring full-ensemble climax. In a duo format, Frisell played a couple of tunes that reminded listeners of his unassailable place within the true-blue jazz-guitar lineage: “Old Folks,” with Munisteri, whose even-keeled story solos were models of musical patience; and “Seven Come Eleven,” in which Lage’s technique was so exquisite that he seemed to be demonstrating some kind of guitaristic sleight of hand. The more inscrutable, postmodern angles of Frisell’s work in the 1980s and ’90s came to the fore on his “Strange Meeting” and “It Should’ve Happened a Long Time Ago,” by his mentor Paul Motian; on both tunes Frisell paired with Ross, whose sound, at once penetrating and ambient, bluesy and ghostly, fit the material like a glove. But it was the everybody-in numbers, placed as bookends, that gained the most in reflection. On “Rambler” and “Egg Radio,” each player settled into a purposeful niche—think of how Afrobeat or some krautrock operates—that gave Frisell’s bittersweet compositions an orchestral scope. On Milt Jackson’s “S.K.J.,” which leads off the 1962 LP Bags Meets Wes!, the proceedings got a touch sportier, but not really; the soloists sought their own level, all the while deferring to Frisell’s gentle dominance.